NASBA’s CPA Licensing Examinations Committee (CLEC) is working to implement changes that enhance the Uniform CPA Examination, CLEC Chair Robert Pearson told the 2007 Regional Meetings. The Committee wrote to all states seeking suggested improvements for the examination, and only received responses from six boards. Some of those suggestions are being addressed by NASBA, some by Prometric and some by the AICPA, he reported. He stressed the importance of state board members making site visits to Prometric test sites in their jurisdictions. If any state does not have the resources to make such site visits, NASBA will assist them, Mr. Pearson told the meetings. He reported that Prometric’s internal site visits had dropped this year, but they had said such visits would be increased. “We want to see if the Examination is addressing ethics – and if that is adequate,” Mr. Pearson stated. CLEC is setting up a task force to explore this issue. 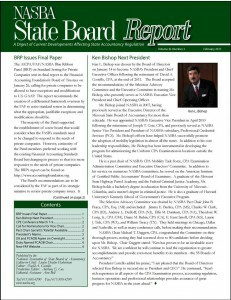 Kenneth Clark, president of the Missouri State Board of Accountancy and a member of the AICPA’s Board of Examiners (BOE), noted that 9 of the 16 current members of the BOE have state board experience: This is the first time such a majority has existed. Five of the BOE’s members’ terms will expire this year, and four of them are among those having state board experience. He called on the member boards for new volunteers to the BOE and its committees. The AICPA’s practice analysis, on which the Uniform Examination is based, may go through July 2007, Mr. Clark explained. This extended time may be required to get a sufficient number of responses from qualified individuals, i.e., those in public accounting who have supervised new CPAs in the last 2-15 years. He estimated approximately 2,000 qualified responses would be needed to make the analysis reliable. The goal is to have the Board of Examiners approve a new content specification outline for the Examination by May 2008.